Heading into the next window of the 2019 FIBA World Cup Qualifiers, the national team faced a huge challenge in building their roster. The biggest man in the pool, Greg Slaughter needed to gain approval from FIBA to play as a local. Today, Slaughter announced that he has overcame that hurdle. I just found out FIBA has approved my eligibility as a local! 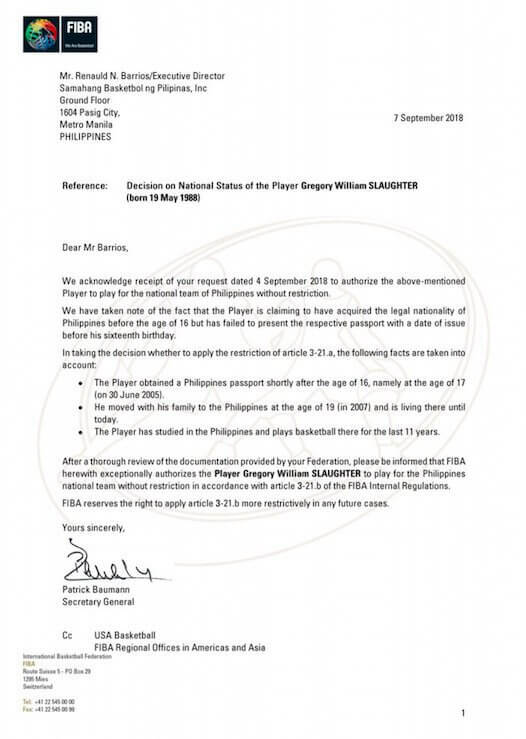 Couldn’t be happier about this, thank you to SBP and FIBA for paving the way. I’m looking forward to beginning a wonderful journey with the national team. Para sa bayan! ?? Slaughter approved as a local is a huge boost for the Philippine Team. He strengthens the front court missing June Mar Fajardo who’s out with a stress fracture and Andray Blatche who is serving his suspension as the team heads into the next window. Because of Coach Yeng Guiao can will now only have to choose between Stanley Pringle or Christian Standhardinger as the naturalized player in the next games. Currently, Slaughter is nursing an injury after rolling his ankle in Ginebra’s last game against the NorthPort Batang Pier. Because of that, he was forced to miss the last two practices of Team Pilipinas. But Slaughter is still part of the 16-man pool flying out for the September 13 game against Iran. Coach Guiao will name his final 12-man roster shortly before their next game. If Slaughter is anywhere close to being healthy by then, he is a shoo-in to be part of the final roster.